In this photo released by Warner Bros., talk show host Ellen DeGeneres, left, welcomes YouTube sensation Greyson Chance from Edmond, Okla. making his television debut performing "Paparazzi" by Lady Gaga during a taping of "The Ellen DeGeneres Show" on Wednesday, May 12, 2010 on the Warner Bros. lot in Burbank, Calif. The episode airs on Thursday. A 12-year-old Oklahoma boy has become an Internet sensation with a video of his performance of the Lady Gaga song "Paparazzi." Sixth-grader Greyson Chance was recorded singing the song, self-accompanied on the piano, at an April 12 school talent show in Edmond, a suburb of Oklahoma City. The video posted on his YouTube site had more than eight million hits by Thursday morning. 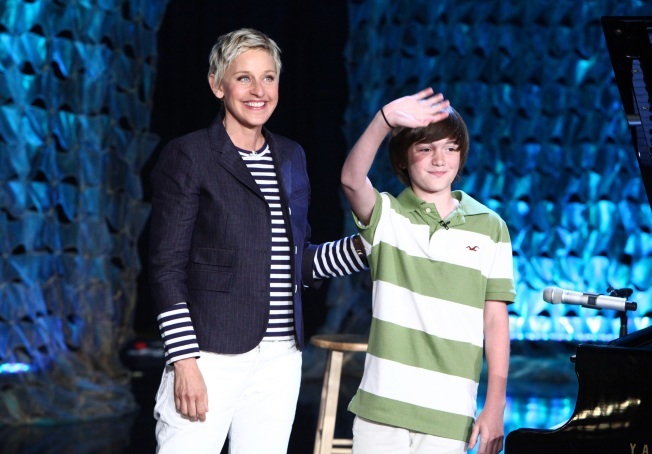 The performance also caught the attention of producers of "The Ellen DeGeneres Show." He was flown to Los Angeles to perform on the show, and spoke by telephone with Lady Gaga. She told Chance he is sweet and talented and said he should follow his dreams. The show will air Thursday. He acknowledged his popularity has increased due to the video and said he's "gotten a couple of (phone) numbers." VIEW THE PHOTOS: Grammy Awards 2010: Lady Gaga's Outrageous Getups!